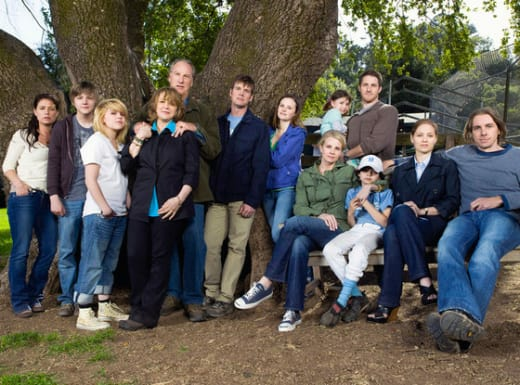 Parenthood Season 5: Who May Get Engaged? The cast of Parenthood gathered at the Television Critics Association press tour in Beverly Hills yesterday, teasing reporters on the scene with a spoiler-filled Season 5 promo. There was Kristina with a new haircut… Jasmine and Crosby with their new baby… and Amber and Ryan discussion marriage! "It's a big decision to take a step like that when you're young and the things that come out after you make a choice like that and you start to feel settled I think would be interesting," Mae Whitman said of Ryan and Amber's possible engagement. "It's interesting to see how different questions come in in a relationship when you're adult and it's more serious…[to see] if they will grow together or separately." Sarah, meanwhile, will have a new apartment and a new job. And, yes, Ray Romano will be back as Hank, but "this is a year of her wanting to figure out her life and figure our what her next step is in life and not be focused solely on a romantic relationship," teased creator Jason Katims. Finally, viewers may need to be a “a little concerned” about Joel and Julia’s marriage, due to the arrival of two new characters played by Sonya Walger and David Denman. "There's a major role reversal in the fact that these construction opportunities are suddenly coming his way and we're going to see the dynamic change quite a bit," Erika Christensen said. "Julia's still unemployed and not happy about it." Parenthood Season 5 premieres on September 26 and there will be an eight month time jump on the premiere.